Amante is a 58-foot custom yacht built by Delta Marine Industries, launched in October, 1994. 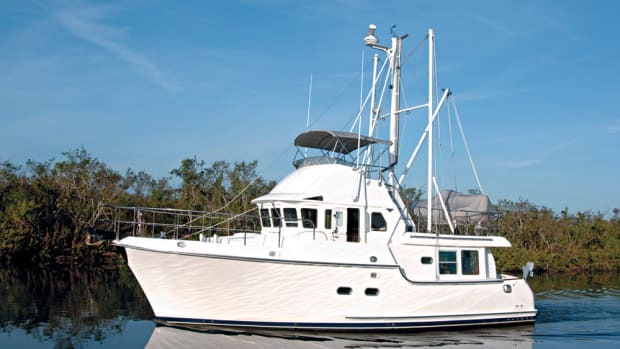 Starting with an established Alaska seining hull, she was transformed into an ocean-going pleasure craft by Delta based on ideas and specifications provided by her owners, as well as yacht designer Steve Seaton and interior designer Maxine Hoddinott. The owners previously owned a Cheoy Lee 53 motorsailer, and started their project to build Amante after searching for more comfortable boating options in a boat capable of crossing oceans. They had read articles about Bruce Kessler’s circumnavigation in the 70-foot Delta Zopilote, and were fascinated to learn that there were power boats small enough to be handled by a two-person crew yet big enough to cross oceans safely and comfortably. They sought out Steve Seaton, Zopilote’s designer, and told him they wanted a boat like Zopilote, but smaller. At an early point in the design of Zopilote, Seaton had sketched out a 58-foot idea for the Kesslers, and, even though it was not implemented, he had it in his design archives and it became the foundation for the Amante project. The search for a builder involved discussions with several boat yards. 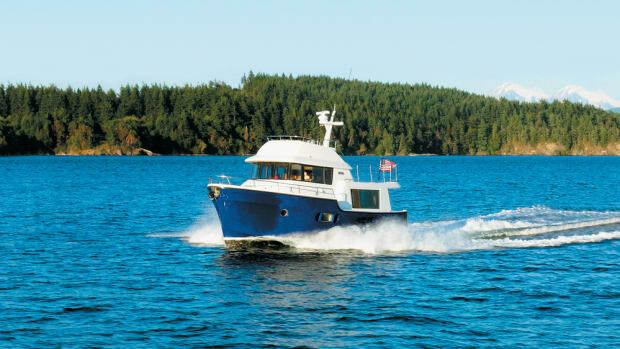 In the end, the owners selected Delta Marine Industries not only because Delta had built Zopilote, but more importantly because the owners felt that Delta had a strong reputation for quality of construction of fiberglass vessels and for seaworthy designs. Additionally, because Delta is located in Seattle near the owners’ home, it was convenient for them to watch over the construction. Since these owners are hands-on people who wanted to be involved in all details of the building project, Delta was a good choice for them. Amante is a raised pilothouse design with flybridge. The engine is located forward, primarily because it was the most cost-effective method to integrate the original seining hull design with the desired pleasure craft design. There are three staterooms—two on the lower level and a third on the main level. On the lower level, the master stateroom with ensuite head is located aft. Forward of the master stateroom there is a guest stateroom with ensuite head and laundry room. The third stateroom is located on the main level forward of the galley. This stateroom works well for those times when additional crew is desired to help with a passage—it is set up with ensuite head and twin berths, and it is located separately from the owner’s quarters yet close to both the pilothouse and the engine room. 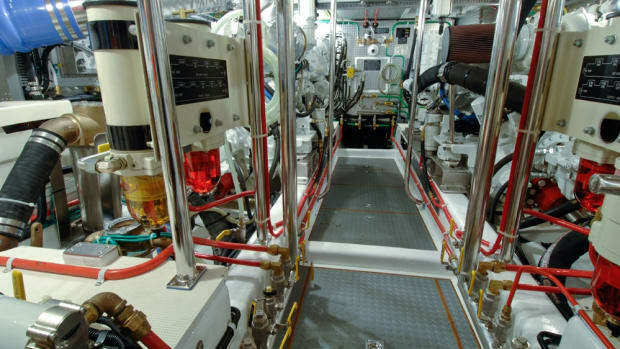 Access to the engine room is also on this level—it is located in an equipment/workshop compartment forward of the third stateroom. The galley and salon comprise the rest of the main level. At the back of the salon there is access to the aft deck, which is partially covered. The aft deck includes a built-in barbecue, a heated wet-storage locker, and a built-in 25-cubic-foot freezer, used to supplement the galley refrigerator/freezer. This separate freezer allows the owners to provision with large quantities of frozen food and thereby reduce the number of times they have to go to shore to reprovision. It also comes in handy for added storage of halibut and crab, when they catch more than they can use right away. Stairs from the salon lead up to the pilothouse, where there are two generously-sized helm chairs, a utility table, built-in settee, watch berth, desk, and office space. Port and starboard side entrances exit from the pilothouse to the boat deck. The foredeck design includes a Portuguese bridge with an unusual and very functional feature: a built-in 38° refrigerated space for vegetable and fruit storage. Using this extra space for storing fresh produce provides enough storage space for these owners to keep produce fresh for about three weeks, and it frees up space in the galley refrigerator. On the boat deck there is stowage for the tender, a 15-foot inflatable dinghy with a 90hp outboard motor. A stainless steel hydraulically-powered davit is used to launch the tender. There is also a high-pressure wash-down faucet, and storage for 140 gallons of tender fuel. There are two sets of stairs from this level—forward stairs that lead up to the flybridge, and aft stairs that lead down to the aft deck. A retractable bimini cover tops the flybridge, where there are two helm chairs and a built-in settee. Amante was built to be rugged. 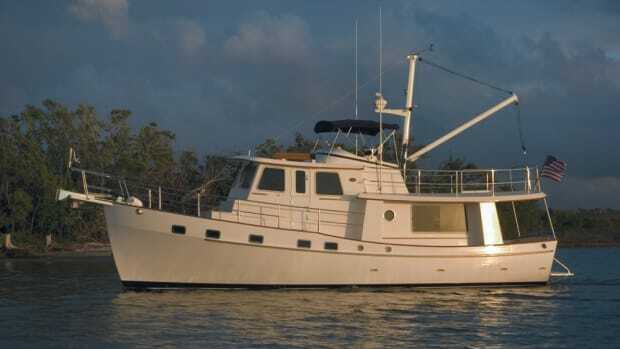 Her hull is solid hand-laid fiberglass with balsa-cored decks and superstructure. Linear polyurethane paint provides a very glossy appearance to the hull. There is a 1-3/4 inch solid steel grounding shoe on the bottom of the keel. At 81 tons displacement, she gives a solid, sea-kindly ride. She is roomy inside, with a 58-foot length and 19-foot 6-inch beam. Designer Seaton says her performance meets all the expectations of the design specifications. For anchor gear, the owner elected to copy the robust gear typically used by fishboats—a custom hydraulic drum windlass. “It’s not pretty,” he says, “but it sure works!” The business end of the ground tackle is a custom-built 350-pound stainless forfjord-type anchor with 100 feet of 3/4-inch stainless chain and 600 feet of 3/4-inch galvanized cable. Upon entering the salon, Amante feels elegant, yet solid and functional. The wool carpeting is cushy underfoot, and the restful taupe cotton and linen upholstery of the furniture creates a very relaxed atmosphere. The bulkheads are finished with a combination of teak and vinyl, and black granite countertops in the salon and adjoining galley provide a striking contrast. All the cabinet doors have Sugatsune knobs for functionality and appearance. These are dual position pull knobs—when they are pushed in, there is a positive latch; when they are extended, the knobs become door pulls. To be consistent with the soft look of the interior, the knobs were custom finished with a bronze color. For added safety, the sliding shelves inside the cabinets have bolt latches to assure the shelves don’t inadvertently slide out when the cabinet doors are open. To get as much space as possible in the salon, side decks were eliminated on the main level. This was a compromise—the larger interior space instead of walk-around decks from the bow to the stern. “We’re pleased with the extra living space provided, and really don’t miss the ability to walk around the deck. We can wash salt water off the windows with a hose, and any serious washing can be handled from the dock,” says the owner. Another feature to gain space in the salon is a unique coffee table. Most of the time it is a small triangular cocktail-height table—but when a larger table is needed, it can be expanded into a full-size dining table that will seat eight people. Special sculptures add individualized accents to this comfortable salon. “We ended up using a silica gel to hold them in place,” says interior designer Maxine Hoddinott. After a year of use, the method seems to have been effective, as the art pieces are still in place. Roman blinds were fitted for the windows. They tuck up out of the way nicely during the day, and have been carefully designed so that the lines match horizontally when all the blinds are down. “Having a real refrigerator is one of the luxuries I wanted as we changed over from sail to power,” said the owner. The 48-inch Subzero refrigerator/freezer with ice maker has certainly met this expectation. Other appliances include a Thermador range with grill, Asko dishwasher, microwave, trash compactor, disposal, and warming drawer. The boat is set up as an “all AC” boat, and all the appliances are electric. The attention to detail in engineering space and storage in the galley is a tribute to the combined efforts of the owners and the entire design team. There is built-in storage in the drawers and cabinets for the stoneware, glassware, pots and pans, mugs, small appliances, and utensils. Every device and tool has its own custom-fitted space. Specially-designed lazy susans slide out to utilize the corner areas. There are acrylic spindles positioned to fit on the sides of the stoneware plates and saucers so they won’t slide. China savers are used between the plates to prevent damage. There is a built-in pantry on the port side of the boat across from the galley, and wire baskets are used in the pantry to assure that all possible storage space is useable. One particularly nice feature was included to help the cook. As most sea-going cooks know, spice bottles in lockers are always a challenge. To make the spices easy to find, Delta built an open, bulkhead-mounted spice rack. Maybe there’s nothing unusual about that, but in addition, they engineered the rack with removable compartments. This allows the cook to group spices for various recipes in the same compartment, then remove the compartment and take all the spices at once to the stove. This is a great idea that enables a bulkhead located away from the stove to be used for a spice rack, and still provide the cook with convenient access to spices while cooking. 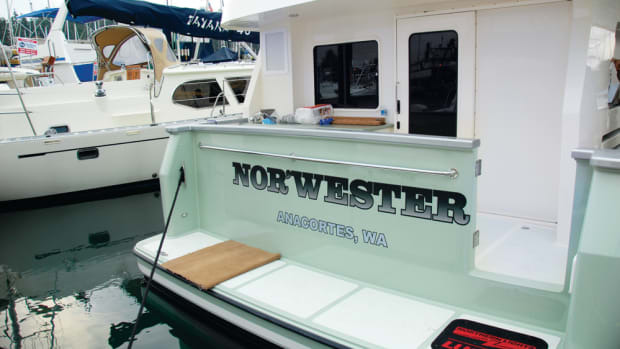 A built-in commercial-grade espresso machine is hidden in a cabinet near the entrance to the galley, underscoring that this boat is indeed a Pacific Northwest boat. The slide-out shelves in the cabinet under the espresso machine have built-in custom-sized storage for the espresso cups and saucers. This location allows someone to be working at the espresso machine without disturbing the person working in the galley. This owner knows how she works in a kitchen, and knew what she wanted in the galley. Of most importance was a good fan to exhaust cooking fumes. “I do a lot of stir-fry style cooking and wanted to keep the area as clean and fresh as possible,” she said. “The exhaust fan works well, but it was installed so high that it hasn’t quite lived up to my expectations.” It appears that this is one of the few details about this boat that didn’t turn out perfectly. Because the owner likes to look out while washing dishes, the stainless sink with drainboard was located at the side of the boat so that a window could be positioned above it. The galley is U-shaped, with the stove and refrigerator to the left of the sink, and the dishwasher to the right. For those times when more than one person wants to work on food preparation, a separate counter with a small sink is located across the boat from the galley. This area is perfect for fixing snacks, cocktails, or a quick breakfast. Some casual dishware is located there, along with a toaster. One of Amante’s design specifications was not to install any ports in the lower deck level. This presented a unique lighting challenge because none of the staterooms have ports. Even though the boat has spot lighting recessed in the headliner throughout, the owners wanted the staterooms to feel like they were naturally lit, especially during the daylight hours. The solution was to install fluorescent lights behind paper shoji screens positioned in the joiner work just as if they were ports. They used tiny fluorescent lights. The effect, although it sounds unusual, is wonderful. Experiments with various types of lighting (incandescent, fluorescent, halogen) resulted in the best effect with the fluorescents. Then came experiments with various colors and weights of paper for the shoji screens. When illuminated, these lights truly simulate natural lighting. Additionally, the shoji screens create a feeling of space in these staterooms that otherwise might have been uncomfortable. The master stateroom has a very special feel to it. The combination of the shoji screens and the fabric sculpture on the bulkhead at the head of the berth gives the cabin a very restful feeling, as it should be for a master suite. There is a built-in settee for comfortable relaxing and reading, a queen-size walk-around berth, granite countertops, and ample drawers and hanging lockers. The ensuite head has a rock tile flooring, an enclosed Corian© shower, and granite countertops. The combination of textures used in this space creates a warm, comfortable feeling. Doing laundry is convenient with a built-in full-size stacking washer and dryer. These appliances are located in their own compartment, which also has a built-in, pull-down ironing board. The fan from the laundry compartment pipes air into the linen lockers nearby to help keep the linens fresh and dry. Maxine describes the pilothouse as “his” space. Not only is this a well-appointed area for navigation, but also it includes a separate space for a desk, computer, laser printer, fax, and other office equipment. Having space for a “home office” in the pilothouse extends options and time that can be spent on the boat. The two leather helm chairs in the pilothouse are comfortable while underway, and the utility table with built-in settee is a perfect place for guests to enjoy the ride too. A cabinet behind the helm chairs contains a slide-out shelf with customized built-in spaces for a large thermos and several coffee mugs. This allows a supply of coffee to be brought from the galley to the pilothouse in the thermos bottle. The coffee, then, can be dispensed from the thermos, right from its storage space in the cabinet. This is a great idea for avoiding spilled coffee while carrying mugs up from the galley while underway, especially if much of a sea is running. Drawers for storing charts in the pilothouse are built-in under the Corian©-topped chart table. These drawers are big enough so that the charts can be stored unfolded, which makes it much easier to organize and retrieve charts. Book shelves and a pilot berth are located aft in the pilothouse. The bridge of Amante hosts a full array of navigation equipment. There are two radars, both Furunos—one is a 72-mile range and the other is a 36-mile range. An American Pioneer 360° dual scan sonar has already proven its value. While leaving Vancouver harbor, the fog unexpectedly and quickly rolled in, and they found themselves in a shallow part of the entrance. The sonar display helped them to locate clear water ahead that was deep enough for them to get out safely. This experience sold them on the value of using the sonar to validate that the water ahead is safe for their required depth. Other navigation equipment includes a Trimble GPS with Magellan GPS as backup; SEA 225 single sideband radio; four ICOM VHF radios; Magnavox Satcom M; Furuno video depth sounder; two Ritchie magnaflux compasses—one in the pilothouse and one on the flybridge; and a Brookes & Gatehouse instrument network—depth, wind (speed and direction), boat speed (log), and water temperature—with quad readouts in the pilothouse and flybridge, and repeaters in the salon and master stateroom. The owners wanted electronic charts, but didn’t have much computer background. So they chose the MaxSea system which they have set up on a Macintosh 6100/60 Power Mac. They have been very pleased with the results. “This system can handle chart data from various producers around the world,” says the owner. “For my cruise to Alaska, I used 10 disks of Maptech charts which covered the waters from Puget Sound to Glacier Bay.” The system worked fine during this initial voyage except for a deviation of 250 feet to port on the trip north and 250 feet to starboard on the trip south. This problem has been described to the local MaxSea dealer, who has advised that he thinks the deviation can be corrected by a small adjustment. He is working with Amante’s owner to assure the unit will operate correctly in the future. For flexibility of communication, an unattended PBX system is installed. This allows the owners to receive and call out on cellular, wire line, or comsat. Using the cellular phone while cruising north was complicated by the separate cellular coverage areas, and because the route travels through U.S. waters, then into Canadian waters, then back into U.S. waters. Keeping track of the correct codes to use to receive calls was very tedious. Calling guides provided by B.C. Cellular and Alaska CelluLink companies were useful, and a book called Cellular Travel Guide, published by Communications Publishing, Mercer Island, WA, also provided resource information. Amante is powered by a single Cummins KT19M, 425/hp, continuous rated at 1800 RPMs, 6-cylinder, turbocharged engine. She has a designed cruising range of 2900 miles at 9 knots with 10% reserves. Two Northern Lights gensets provide generated power—a 36 KW unit with hydraulic power take-off, and a 22 KW unit. Because the owners chose to set up an “AC” boat, when Amante is away from shore power, a generator is run at all times. They typically use the 22 KW genset for electricity, and the 36 KW for larger jobs, such as driving the thrusters during dock maneuvering. So far they have not required the use of both generators at the same time, but feel that power from both units may be needed when they get to warmer climates and want to run the air conditioning at the same time as other electric appliances are used. For emergency backup, there is a chain-driven, hydraulically-operated, get-home drive. To engage this system, the chain must be manually installed. When operational, the get-home drive will move the boat at 4 knots using hydraulics powered by the 36 KW genset. For battery power, Amante uses three isolated banks of gel batteries. One bank of two 8Ds for the house system, one bank of two 8Ds for the starter, and one bank of two 8Ds for the electronics. Two separate battery chargers are installed—one for the house and starter, and one dedicated for the electronics. The alternator is a 90 amp unit generating 24 volts DC. The boat’s electrical system is designed for 220 volts AC and 24 volts DC. Single point fueling is accommodated by a fuel transfer system that easily moves fuel among the three fuel tanks. The fuel transfer system also is useful in maintaining boat trim. For example, when the dinghy is off the boat, fuel can be transferred to compensate for the loss of weight from the dinghy. Amante carries a total of 3365 gallons of fuel in three tanks located to port, starboard, and forward of the engine room. Diaphragm pumps provide sturdy, dependable pumping of the black and gray water tanks. There are two identical pumps installed—one for pumping out the black water and the other for the gray water. The plumbing for these systems has been set up so that if one of the pumps fails, the remaining good pump can be used to pump out either tank. Amante has a split wet exhaust system with keel cooler. Because her engine is located forward, the exhaust is located amidships. The split feature directs the exhaust above the waterline if the engine is running below 1000 RPMs, and below the waterline if the RPMs are above 1000. This helps to reduce diesel exhaust soot marks on the hull. Passive stability has been designed into the boat by incorporating rolling chocks in the hull form which has a hydrodynamically round bottom. Active stability is provided by Naiad 12-square-foot non-retractable fins that are gyroscopically controlled and hydraulically actuated. 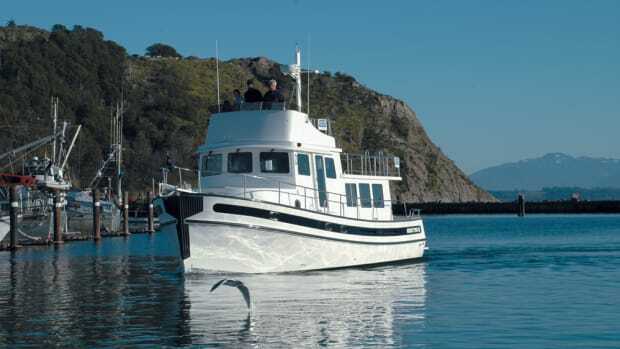 For added comfort and fuel economy, Amante design also includes a 46-inch diameter bulbous bow. This contains a 603-gallon floodable tank that is filled and emptied as needed using an engine-driven pump. “The bulb concept works well,” comments Jay Miner. “In normal sea conditions, it reduces fuel consumption. Also, the damping created by the shape moving through the water slows the boat’s pitch and sea motion. The bulb can be flooded with water as a means of maintaining trim; for example, as the fuel tanks are emptied.” Miner sees an industry trend toward active stabilization as the most cost-effective way of providing better motion at sea. For safety, a Sea Hornet alarm system monitors the bilges, fire, engine, auxiliary, and access. An automatic/manual Halon fire-control system is installed in the equipment room, engine room, and lazarette. There are also nine dry fire extinguishers aboard Amante. Interior climate control has been emphasized on this boat. Because it is so tightly sealed, the owners wanted to be sure the air didn’t get stale. To address this concern, they have set up a system that continuously pumps fresh air throughout the boat. Each stateroom has separate air temperature controls. Heating is provided by electrical heat strips in the air ducts. Air conditioning is provided by a Marine Air chilled water system. Amante’s water tanks hold 924 gallons, and additional watermaking is provided by a Sea Recovery watermaker. Fresh water is used throughout, from deck/anchor washdown to head flushing. To help keep Amante’s stainless looking like new, the owner had an ion filter added to a fresh water high-pressure wash-down system. The ion filter reduces water spotting on the stainless. He is pleased with the results, but adds that the filter requires screen maintenance every 150 hours. Another luxury that these owners wanted in their change from sail to power was to have enough hot water for comfortable showers. So, their engine room includes two 60-gallon fast recovery hot water tanks, plumbed in series. No lack of hot water for them! This article wouldn’t be complete without some discussion about the project to build the Amante. As mentioned earlier, a team composed of very-involved owners, yacht designer Steve Seaton, builder and co-designer Delta Marine Industries, and interior designer Maxine Hoddinott worked together to create the boat. The entire project took about two years. The design was crafted by Seaton, with technical changes provided by Delta. Together, they worked to turn the sturdy hull form into a 58-foot ocean-going pleasure boat. And together they worked to design and place the engine and systems. Maxine Hoddinott, head of Bouillon, Christofferson & Schairer’s yacht interior design department, was involved early in the project and coordinated with the other members of the project team. She had worked with the owners previously to remodel the interior of their Cheoy Lee motorsailer. Her primary responsibility in this project was in the area of human factors engineering, i.e., how the owners wanted to live on the boat. During the design process, she considers such issues as what style of cabinets are desired, how they should be laid out, spatial relationships, traffic flow, size of the family, if there are any medical problems, who does which tasks, and so forth. Maxine emphasizes the project planning details, such as setting up a schedule and meeting deadlines—she coordinates the subcontractors, builder, and client. Having worked with these clients before, Maxine knew they were very detail-oriented and that they wanted to be very involved with the project. “I handle the details,” she says, “but it’s their dream, so they make the decisions.” She knew that these clients would be traveling a lot during the boat building project, so she created a one-half size set of blueprints they could pack and take along on their trips, so they would have something to refer to during telephone consultations. At the end of the planning stage, a 32-page set of blueprints and specifications was produced. This included details such as color boards, renderings, fabric selections, appliance choices, and so on. The owners specified that all materials used be environment-friendly. Maxine selected 100% cotton fabrics that were Teflon© coated and treated for flameproofing. The wall vinyl used is commercial grade and contains bacterial retardants. The carpeting is cut pile, 100% wool, custom-dyed. When asked how they felt about the boatbuilding project, Amante’s owners are quick to say that they really enjoyed the team of people who helped them. Also, they were very satisfied with their choice of Delta, particularly with the fact that the boat yard was close to their home so that they “could drive the people at Delta crazy by hanging around and giving advice all the time.” In addition, this project occurred at a point in the owner’s life when he was phasing out of day-to-day business, and into semi-retirement—a perfect time to be involved in a major boatbuilding project. The only things they are planning to change, for now, are to add (1) a KW meter to monitor the gensets and (2) a live bait tank on the stern. They would like to have the KW meter provide readouts near their other instrument readouts so that they can tell how much load they are putting on their gensets without having to go down into the engine room. The live bait tank idea is in response to their success catching crab while they were in Alaska. When you can catch 12–15 keeper-size crabs each time you set your trap, where do you put them while you are waiting to clean them? A bait tank would be perfect! Amante’s initial cruise was three months in Alaska in the summer of 1995. They covered 3000 miles and put 322 hours on their engine, and felt that they had a great shake-down trip and were very satisfied with the boat’s performance. They were captivated by the scenery and wildlife of Alaska. In particular, they liked Tracy Arm, Frederick Sound, and Sitka.